Children and youth are the future of the nation. Different Resource Centers were set-up in small communities to offer educational opportunities to some of the poorest regions in Nepal. 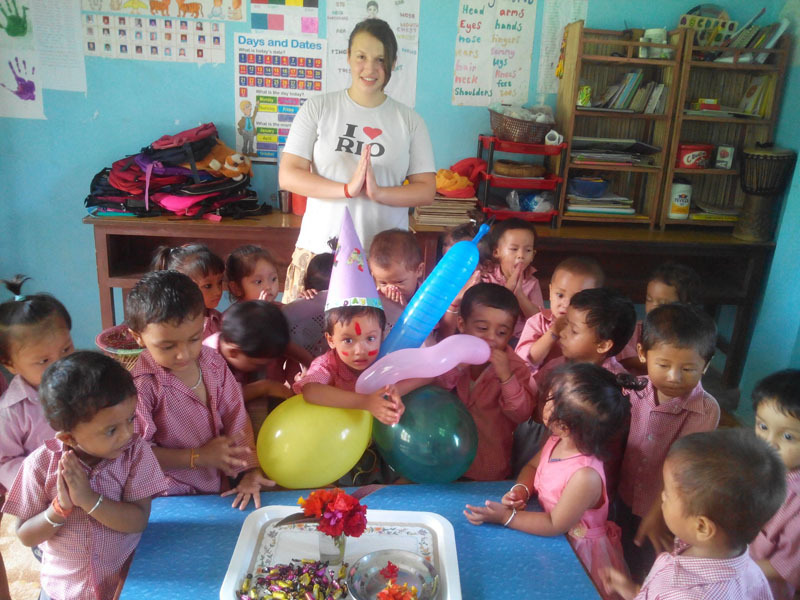 The Center, often known as Libraries, are there to help the local children improve their English and learn from the many International cultures that the volunteers bring through WE VOLUNTEER NEPAL. The children attend before and after school and educational games and singing and dancing are a great way to get into the spirit of Nepal. Volunteers do not need teaching qualifications to partake in this program, just a passion for children and having fun! Children enjoy new experiences as much as we. So, anything you can bring from home to show them how your life works and culture differs is beneficial. The locations of our Resource Centers ensures total immersion into Nepali life and its culture. Our host families are all located within walking distance of the Resource Centers and the villagers also aid the early morning routines with hot cups of “CHIYA” (Nepali tea). The time spent in the village creates a real sense of community, you live close by, walk through the village everyday, you become part of their lives for a while and with the local festivals and the occasional wedding to attend there is no end to how immersed you become in village life. If that is not enough to satisfy your needs there are local schools we support who are always more than welcoming to receive help from international volunteers. You can give as much or as little time as you like, and classes normally revolve around a curriculum unlike the Resource Center where you are free to make your own lesson plans and bring your own ideas and games to the children. Volunteers are also welcome to teach different subjects e.g. mathematics, history, science, geography, computer, technologies, music and other subjects. All higher education in Nepal is in English, so it is vitally important that children must learn English to continue further higher education.